Oreo the cat, a pianist, admired Ketzel's musical talent. Ketzel was a piano composer who won an award and international acclaim for her elegant composition. She was also a tuxedo cat, always sharply dressed to perform. Sadly, the 19-year-old cat passed away in New York City on July 13th. 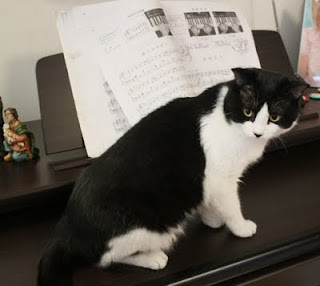 He entered her composition, “Piece for Piano, Four Paws,” in the Paris New Music Review's One-Minute Competition. Ketzel won a certificate of best mention for creative instinct and imagination. The piece premiered at the Peabody Conservatory in 1998. Ketzel (means "cat" in Yiddish) later heard her composition performed at the Museum of the City of New York. Cotel who passed away in 1999 said Ketzel “was his best student and her fame surpassed his,” said his wife Aliya Cheskie-Cotel. You can hear an audio of Ketzel's "little miniature" composition provided by the City Room blog at the New York Times. We knew of her, but hadn't heard she'd passed away. She had an amazing, long life, though! That is so sad. Run free and play often beautiful one. So sad to hear this news, But Thanks you to passed on. What a shame! She was a beautiful girl and very talented! We are sorry to hear of the passing of such a talented tuxie. She is beautiful, sharply dressed and so talented! It's never easy to lose a beloved fur friend, but 19 is a pretty long life for a cat. While we are sad that Ketzel crossed the Bridge, we know that she had a long and happy life. Thanks to her playing the piano, we got to know about her!! WE send purrs to her family. We are sorry to hear the sad news about Ketzel. She was such a talented kitty! I'm sure she was very happy kitty too with piano and her family. We are sending warm thoughts to her family. I am embarrassed to say I had never heard of this talented kitty til now.